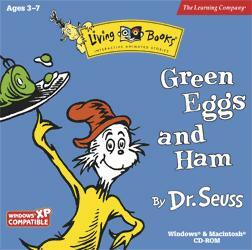 "Dr. Seuss Green Eggs & Ham"
Instill a love of reading in an entirely new way with this exciting adaptation of Green Eggs and Ham. It takes the original number one selling Dr. Seuss book one step further. Meticulously animated from hundreds of sketches, it’s filled with 19 interactive pages of delightful scenes, surprises, and activities. Your child directs the action with just a click of the mouse. Match the object with the rhyme in time to help our heroes near the story’s conclusion. Aspiring rhymers can create their own three word rhymes.